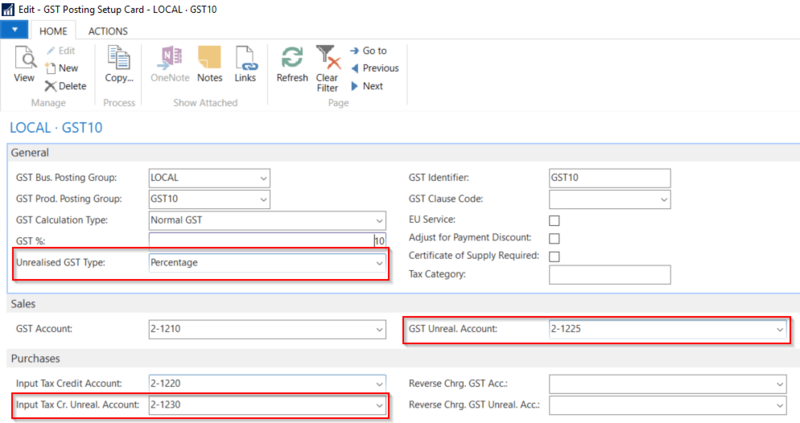 You can set up NAV to report GST on both cash and accrual bases using Unrealised GST functionality. This functionality enables GST to be calculated when the invoice is posted and not realised or due until the invoice is paid. The first step is to activate the functionality by setting the ‘Unrealised GST’ and ‘Prepayment Unrealised GST’ to True. You can select ‘Unrealised GST Type’ from the below options. And this is it!! We are now set up to use GST unrealised functionality for GST reporting on accrual and cash basis. Now when you post the Invoice, Unrealised GST Account will be affected. And when you make payment, Realised GST Account will be update reversing out the Unrealised GST Account. In the example below, I made a partial payment of 50%. So $10 is taken out of Unrealised GST Account and posted to Realised GST Account.